Believing In Horses - Valerie Ormond - BELIEVING IN HORSES, TOO JOINS BELIEVING IN HORSES AS MULTIPLE AWARD WINNING NOVEL Sadie Navarro worries about her Navy father serving in Afghanistan. She turns to her love of horses to distract from her secret problems in her thirteenth year. Sadie commits to showing at the largest local horse shows and volunteering for therapeutic riding programs – both brand new to her. She looks forward to her new pursuits. That is, until one of the therapeutic riding programs arranges for Sadie to assist wounded warriors. Now Sadie must face her deepest fears head on. And then there’s the first horse show. Both the enormity of the event and her inexperienced horse rattle her. An unwelcome show ring rival makes matters even worse. Sadie wants to make her father proud. She wants to help others. But where will she find the courage to overcome her fears? Believing In Horses on HorseGirlTV﻿ Click the above photo to bring you directly to the episode, or click the following link: http://www.horsegirltv.com. Thanks to everyone who helped us get here! Sadie Navarro worries about her Navy father serving in Afghanistan. She turns to her love of horses to distract from her secret problems in her thirteenth year. Sadie commits to showing at the largest local horse shows and volunteering for therapeutic riding programs – both brand new to her. She looks forward to her new pursuits. That is, until one of the therapeutic riding programs arranges for Sadie to assist wounded warriors. Now Sadie must face her deepest fears head on. And then there’s the first horse show. Both the enormity of the event and her inexperienced horse rattle her. An unwelcome show ring rival makes matters even worse. Sadie wants to make her father proud. She wants to help others. But where will she find the courage to overcome her fears? Click the above photo to bring you directly to the episode, or click the following link: http://www.horsegirltv.com. Thanks to everyone who helped us get here! 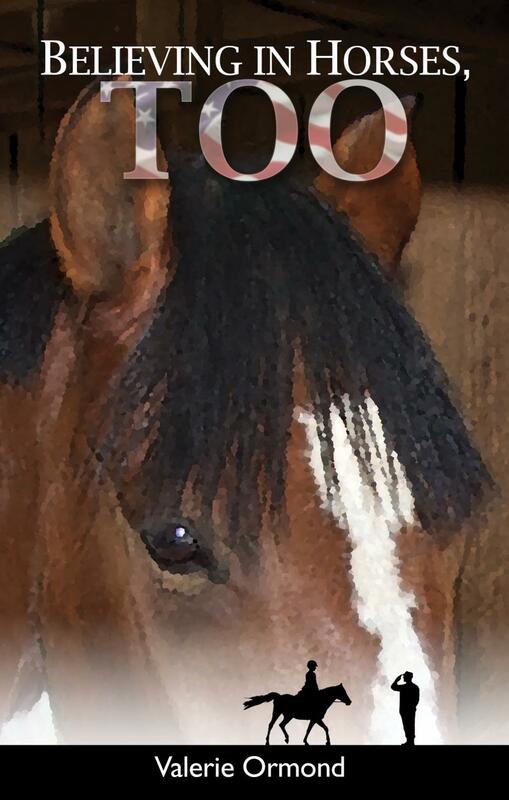 You have reached the website and blog of Valerie Ormond, author of Believing In Horses, and Believing In Horses,Too, novels for horse lovers of all ages. Please check out the book trailer above; music provided thanks to world-renowned band Gaelic Storm. The Believing In Horses books recognize today's youth want to be part of the solution to today's problems and celebrate this notion through their central character's involvement with horses. Using a blend of current technology with intrigue, suspense, and realistic life lessons, these books are a must read for the young and the young at heart. Horse crazy Sadie moves for the sixth time to Bowie, Maryland, only to find out that her Navy dad is deploying to Afghanistan for a year. To ease the transition, Sadie's parents reward her with her dream of a lifetime, her own horse. “Lucky,” her beautiful tri-color pinto, quickly becomes her best friend and equine learning partner. Via the internet, Lucky and Sadie come across ten horses in a holding pen waiting to be sold at auction, and Sadie commits to saving them. Sadie's efforts include proposals to horse rescues, grass roots lobbying, a media appearance, school help, and various other efforts to accomplish her mission in a few short months. Along the way, Sadie meets both good and bad people, and experiences joy, fear, disappointment, self-doubt, lost horses, and a level of responsibility she has never known before. Click ﻿here to read a sample chapter. Would love to hear your comments on Facebook! Believing In Horses and ﻿Believing In Horses, Too ﻿are here! Available at Amazon, Amazon.com.uk, Barnes and Noble, and the retail stores and online outlets listed on the Buy the Book page. For those seeking catalogs, distribution is by the ﻿Independent Publishers Group.